When considering your church’s insurance, it’s important to have a good grasp of what’s actually covered. What’s NOT covered on my policy? Why might our claim be denied? The term “Flood Damage” refers to a very specific type of water damage, which is not usually covered by most policies. In the insurance world, “Flood” refers to “rising water” or “surface water” that seeps in from the outside. Usually it comes in under a door or seeps through a porous wall (like a basement for example). What’s Not Flood Damage? What kind of Water Damage IS Covered? If a baptistry overflows or a toilet backs up, your policy will usually cover these things. While your building may be flooded with water, in insurance terms, this type of damage isn’t considered “flood”. Another example is when a wind storm causes significant roof damage and creates an opening for rain to come in. This would also not be considered “flood” and therefore would be covered as the water is entering through a “storm-created opening”. Most companies offer very limited (if any) coverage for flood as part of their property insurance policies. In these instances, you will generally have to purchase separate “flood” policy in addition to your regular policy in order to have coverage for flood damage restoration coverage. Costs and requirements for this coverage vary greatly from location to location and are also affected by the construction of your building. However, since almost all flood policies are ultimately underwritten by FEMA, pricing is generally the same from company to company. It’s important to note that while higher risk flood planes are obviously more likely to have flood damage, ALL areas have a potential risk—even on a hill. There are a number of things that can cause damage to roofs. Not all of them are covered on your policy. Sometimes wind or hail or lightning can do significant damage to the roof and lead to extensive sanctuary repairs. While such damage is normally covered, there are some types of damage that are not, including lack of maintenance, faulty craftsmanship, or even “wind driven rain”. Flat roofs are notoriously bad about this kind of damage—especially when they are covered with tar and gravel. “Wind driven rain” is a bit different, however. Much like “flood” coverage, wind driven rain is not covered. This type of damage usually results when wind forces water to enter the building through normal openings in the building (weep holes, between entrance doors, open windows, etc.). However, if a strong wind literally blows the doors off their hinges or a tree through a window, it is NOT considered “wind driven rain” and is therefore usually covered. Unfortunately, “wind driven rain” is rarely available. Most companies do not offer this type of coverage. In general, insurance policies are not designed to pay for maintenance on the building. Storm drains clog, silicone seals and rubber washers deteriorate, and no roof lasts forever. But these things are considered maintenance issues. If your building leaks because the seals or roof were not maintained or your window frames rotted out over time, these are considered maintenance issues. Any damage that can be traced back to maintenance issues is usually denied by adjusters. Sometimes, a church is either built poorly or repaired poorly to begin with. If a roofer does a poor job repairing your roof or if the building was built with faulty materials or poor quality construction and these things lead to a property claim, the claim will most likely be denied. These types of damages fall on the shoulders of the contractor/repairmen who did the work. If the insurance company pays to repair hail damage to your roof, they are not going to pay AGAIN for damage caused by faulty workmanship on the part of the contractor. At times, the only damage to a church may be cosmetic. If this is the case, the claim will usually be denied. However, this usually only occurs if the damage doesn’t otherwise compromise the church building. For example, a metal roof dented by a light hail storm might look bad but might not be covered if the roof is still fully functional. How do my deductibles apply? Is there a separate deductible for Wind/Hail? If so, how much is it? Watch out for special “wind hail deductibles”. While not all policies do this, many companies will put a 1% or 2% wind hail deductible on your policy. This is bad. It means that any damage cause by wind or hail will have a very large deductible. While 1% may not sound like much, what it’s referring to is 1% of the replacement cost of the entire building. Say, for example, you have a $2M building and you have a 1% wind hail deductible. This means that your deductible for any wind hail damage would be $20,000—even if your normal deductible is just $1000. If at all possible, stay away from special “wind hail deductibles”. It’s always better to make sure that the property deductible on your policy is a “per occurrence” policy. This means that each deductible applies ONLY ONCE per each occurrence. In other words, if you have several buildings that all get damage from one storm, there will only be one deductible. This is much better than having a separate deductible for each building IN THE SAME STORM. How did you determine the value on our building? Why is the value on our building so high? There’s no way we could sell it for that much. In the insurance world, the values on your church have virtually nothing to do with “market value”. The value on your building represents how much it would cost to REBUILD your building with the same kind/quality materials that you have now—only new. This valuation is known as the REPLACEMENT COST. While you may not want to build back the same building that you have now, the property values on your policy should be based on how your church is built now—NOT how you might rebuild it in the future. IMPORTANT: The property values on your church should be determined by the agent giving you the proposal—NOT just the values on your current policy. The agent is the person who is supposed to do the initial inspection of your church to determine its replacement cost. Make sure that they gather these values on their own. If they have done their work correctly, the values will be similar to what you already have on your policy, but NOT EXACTLY THE SAME. 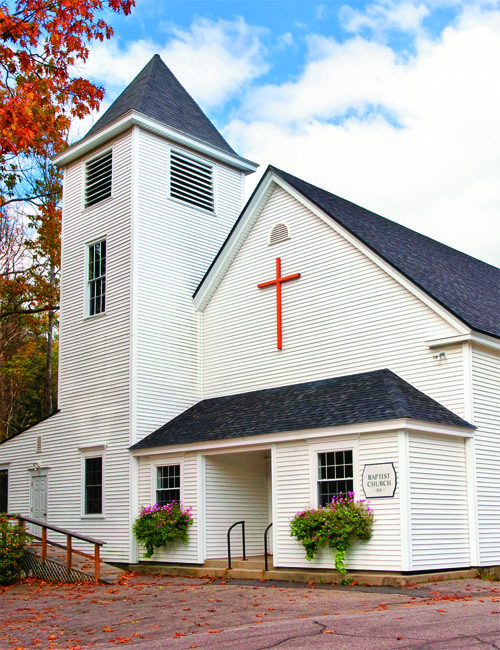 In certain cases, you can request a depreciated value on your church building. This is known as ACTUAL CASH VALUE (ACV). Like Replacement Cost, ACV is NOT linked to the “market value” of your church. Instead, it starts with the Replacement Cost and depreciates that value based on the age and condition of your church building. With lower values, your premium will also be lower. There is a tradeoff, however, when choosing ACTUAL CASH VALUE. With this option, any damage to your church building—even just a little bit—will be subject to depreciation. For example, on an ACV policy, if your roof is 20 years old and a hail storm tears it up, your insurance check will be reduced based on the age and condition of the roof before the storm. Unless your church is full of contractors willing to donate the labor, ACV isn’t usually the best option. We recommend sticking with REPLACEMENT COST.